Fall 1977. 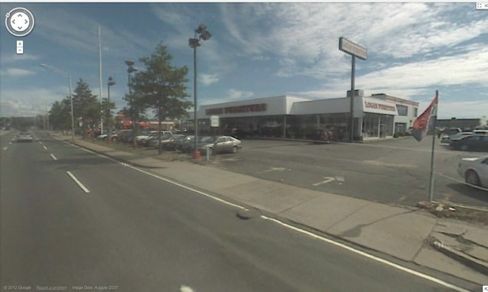 Sea Crest Motors was a Cadillac-Pontiac-Mazda dealership on Route 1A in Lynn, Massachusetts. The Indian could be a reference to Pontiac, the Native American chief and namesake for the car company. Very impressive to gaze up to at night; I don't think he sold many cars though. View full size. Submitted by Jethro on Tue, 07/03/2012 - 6:51am. My uncle had a Caddy like that, except it was a rag top in triple-white! As a kid I just did not grasp the concept of "It's too hot to put the top down today!" As a "grown-up" I still don't buy that one. Oh, and I'm pretty sure that's a Mark IV (1972-76) as the Mark V (1977-79) had a slimmer, less bulbous roof. I wouldn't mind having a nice example of either one! Our '69 Lincoln Continental four-door featured a custom license tag that read "MYOT." Always got a grin at traffic lights! Submitted by Andy From Boston on Mon, 06/18/2012 - 10:36pm. Building still stands on the Lynnway, selling furniture now. Mom grew up in Hyde Park and taught me never to go to "Lynn Lynn city of sin, you never come out the way you came in"
Submitted by ross442 on Wed, 06/06/2012 - 6:14pm. I spy at least three Firebirds in the background; one is a 74 or so Esprit or maybe Trans Am, also the back tail of what is probably a four door 75 or 76 Grand Am (yes they used the name back then as well) as well as the smattering of Cadillacs. The Biarritz Eldorado is beautiful; I've only seen them as beaters, being a bit younger. There is also a station wagon on the sales floor, it's the debut of the new smaller midsized G-body for 1978 e.g. Cutlass, Monte Carlo, here in Pontiac Le Mans Safari trim. Cool pic. I love to see a dealership pic that's of a different era then those usually posted here. Of course I love the old ones as well. Submitted by Coljar on Thu, 05/24/2012 - 2:27pm. There's one just like this big fiberglass Indian at a car lot on the southside of Parkersburg, WV. It's been moved at least a couple of times since the 1960's, but he's always been at a car lot. Submitted by gen81465 on Mon, 05/21/2012 - 10:09pm. Submitted by 19thCenturyGirl on Mon, 05/21/2012 - 6:24pm. Oh this pic of the Lincoln brings back memories. I had this exact used car in 1979. I LOVED that car. Ultimate smooth ride, luxurious interior, big, fast engine. Sure it was a gas guzzler, but for a 20 yr. old girl, I was the envy of all my friends, LOL! It was like driving a sofa! Submitted by Hillary on Mon, 05/21/2012 - 12:55pm. Submitted by Jimmy Longshanks on Mon, 05/21/2012 - 12:39pm. Submitted by danhawkeye on Mon, 05/21/2012 - 11:27am. VictrolaJazz : For comparison, a milspec Humvee starts at 5,200 lbs! Those things were led sleds for sure. Submitted by jimboylan on Mon, 05/21/2012 - 10:52am. The mold for the large Indian was used for many customers, and sometimes painted as a Caucasian Giant, if that would better fit the name of the purchaser's business. Submitted by skylark68 on Mon, 05/21/2012 - 7:20am. Nice display at this dealership. This is the used car (pre-owned in today's jargon) area as evidenced by the late model cars sitting around (I noticed a nice looking '74 or '75 Firebird in the background). I like how the dealer positioned the Eldorado next to the Lincoln Mark V. Those were some great years for cars (outside of the smogged down engines). Submitted by bigguy1960 on Mon, 05/21/2012 - 6:41am. The car directly under the indian is a 1978 Cadillac Eldorado Biarritz. The Biarritz was the top trim level, and is distinguished from the 'ordinary' Eldorado by the addition of chrome trim from the sides of the hood to the kick-up of the rear fender, as well as the 'coach' lights on the side of the C pillar, padded leather-grained vinyl roof, pillow-topped leather seats, and available gold plating on all emblems and crests. I have one, and believe me, it is the world's gaudiest, least useful car - the interior is small, and the trunk won't even hold two suitcases. Pure American in-your-face ersatz luxury, the sort of thing that put the American Auto industry on the ropes. Submitted by Tell it to Joe on Mon, 05/21/2012 - 6:04am. I can recall shopping at that dealership, but why I have no idea. Living on the South Shore of Boston it would not have been convenient or smart to buy there. I do love photos of shiny new cars in the dark! Great photo Rizzman! Submitted by pjd47 on Sun, 05/20/2012 - 11:28pm. A Pontiac dealership here in San Antonio had one of those perched up very high. It became a common target for archers with it rarely not having a few arrows in the chest. Submitted by VictrolaJazz on Sun, 05/20/2012 - 10:11pm. The Eldorado - 4,955 lbs! The Continental - 4,652 lbs.! Submitted by Dennis M on Sun, 05/20/2012 - 8:46pm. When the Cadillac dealer put a late model Lincoln on his used car lot and the Lincoln dealer did the same. Two nice looking "personal luxury cars" there though.